Face First is a power trio led by Robert (Skinny Bob) Barney. Recorded in 1987, and produced by Jim Pitman, of "The Strawberry Alarm Clock." The album received steady airplay on a Salt Lake City Z-Rock affiliate. The band was a returning guest on the KBER morning show with Katherine (Downtown) Brown and Street Strider. 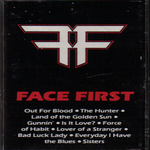 Face First toured the intermountain, and Northwesern states through 1986-89. Musical influences are AC/DC, Rush, Ted Nugent.